There’s only one real item on Hu Jintao’s summit wish list. When Chinese President Hu Jintao meets his American counterpart at the White House tomorrow, he will undoubtedly go through the motions of engaging him on substantive matters. But there will be little in the way of agreement: At the last summit, in November 2009, China and the United States released a 4,223-word joint statement that became a dead letter within three weeks, after acrimonious exchanges at the Copenhagen Climate Summit. Now relations between the two countries are far worse, and Hu does not appear to be under any illusions about his ability to move President Obama in directions Beijing wants. Why, then, is Mr. Hu flying half way around the world to show up in Washington for a one-day summit? In truth, the Chinese supremo is primarily looking for the images, to be beamed back to China, of the pomp and ceremony of a twenty-one-gun salute on the South Lawn in the morning, and a black-tie dinner that evening. We know Hu cares about such pageantry because, in 2006, he turned down a then-coveted invitation to a down-home visit at President Bush’s Crawford ranch, and opted for a formal trip to the White House, where the images on China Central Television would be more impressive to Chinese eyes. At the time, Beijing called that trip a “state visit,” but Mr. Bush declined to do so. Officially, it was termed an “official visit.” The forty-third president understood Hu’s craving for legitimacy and refused to fully satisfy it. Hu is sometimes called the world’s most powerful person—Forbes magazine gave him that accolade in November—but he is a weak leader back home. Just how weak was revealed in two startling incidents within the past three weeks. On Tuesday, after the state-run Chengdu Aircraft Design and Research Institute performed the first flight test of the J-20 stealth fighter—an unmistakable slap in the face of Defense Secretary Robert Gates, who was visiting Beijing at the time—Hu professed not to know that the test had occurred. If the Chinese leader was telling the truth, the test flight reveals a remarkable defiance of civilian authority by the flag officers of the People’s Liberation Army, an obvious attempt to undermine the military cooperation Hu said he wanted to foster. Or if, as is more likely, Hu did in fact know about the timing of the test, he nonetheless said something that made himself appear inept. One has to wonder about a political system that creates incentives for its top leader to publicly imply that he is both ignorant and weak. Either way, the unmistakable impression is that Hu seems to have much less influence than is often assumed. This could be due to the fact that China is in the middle of a transition to the next generation of political leaders—led by Xi Jinping—who are gaining in power as Hu loses his in the long run up to the actual handover. Hu doesn’t only have problems with senior leaders in the Chinese capital. Another high-profile event has underscored the difficulties he is having with the 1.3 billion people spread across China: For the last few years, as a part of his efforts to show concern for the beleaguered citizenry, Hu has made a series of highly publicized visits, dubbed his “dumpling policy” because he eats dumplings with common folk in humble surroundings during holiday seasons. On December 29, Hu’s latest stop on the dumpling tour brought him to a government-subsidized apartment in Beijing to visit Guo Chunping, a single mother, and her daughter. At a time when people are paying stratospheric rents across the country, Ms. Guo told Hu that, because of the benevolent government, she was only required to shell out $12 a month. The amount was significant because similar flats in the city were going for almost 30 times that sum. The Chinese state media trumpeted the visit—thinking it would showcase the government’s efforts on behalf of ordinary citizens—but instead the report immediately triggered national outrage. The woman was, according to various theories found on China’s lively Internet, lying about the amount of her rent, not poor and so not entitled to subsidized housing, renting out her apartment for outrageous sums and pocketing the difference, or a civil servant undeservedly enjoying a benefit not available to less-privileged citizens. What seemed most outrageous to China’s Netizens, however, was the fact that the whole event was staged. The real target of the white-hot anger was not the now-universally reviled Guo—she just happened to host the dumpling tour at the wrong time—but Hu, due to a fundamental lack of trust of the Communist Party. For all his power in China, he has lost the ability to communicate with the Chinese people. He can keep them in line with increasing coercion and repression, as he has done during the last eight years, but he is having trouble persuading or leading. Chinese society is changing faster than any other on earth at the moment, and the ongoing transformation is shaking the country. Senior officials of the one-party state simply cannot keep up. At a time of growing resentment on a wide range of issues—unaffordable housing is only one of the latest grievances—the Communist Party is looking at the Washington summit as an opportunity to demonstrate to the Chinese the acceptance of its rule by foreigners. 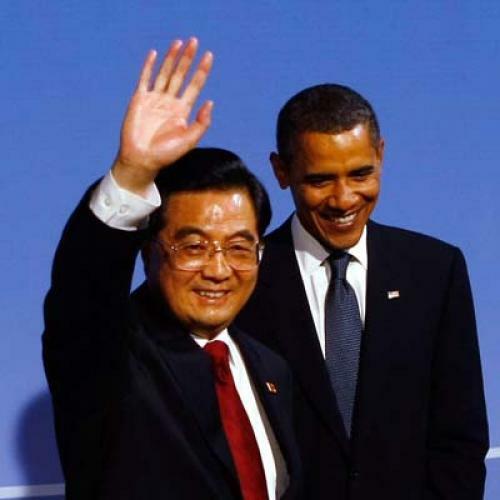 Hu Jintao will, of course, try to persuade fellow summiteer Obama to accede to China’s various requests, proposals, and demands, but that is not the primary purpose of his trip. And because the primary purpose of the trip is to look strong to an audience back home, Hu lacks incentive to go out on a limb for agreements great issues of the day. China, considering everything, may be a strong nation, but Mr. Hu, considering his position in the Communist Party and the Party’s role in society, is weak. And for that reason, the possibility of meaningful agreement in Washington is slight. Gordon G. Chang is a Forbes.com columnist and the author of The Coming Collapse of China.